Fox's Does Someone Have to Go? Comes to Hulu on June 16, 2015. "You will not see a more emotionally engaging Batman movie in your entire life." Batman has always held a special place in the hearts of superhero fans. Orphaned at a young age, he is an emotionally intense mortal whose compassion and sense of justice have helped him rise to heroic heights. LEGENDS OF THE KNIGHT weaves together the uplifting true stories of individuals who have embraced their inner superhero, overcome devastating obstacles, and unselfishly given to their communities because of their love for the Caped Crusader. 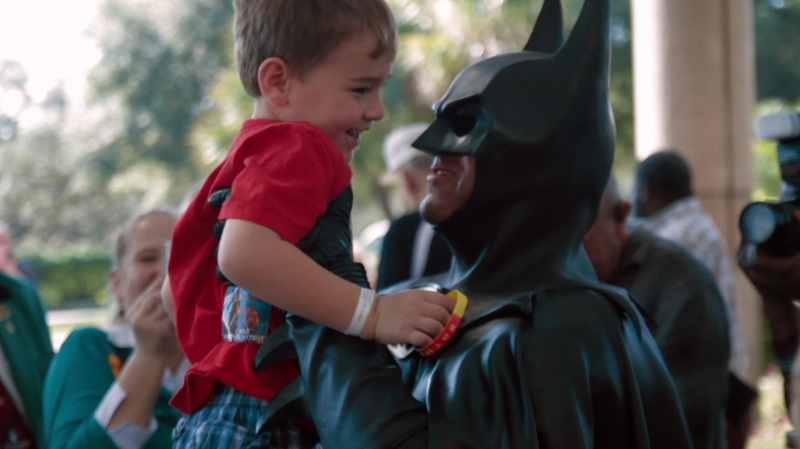 Through the deeply personal tales of Batman fans, writers and filmmakers, this feature-length documentary encourages viewers to find their own uniquely courageous paths. Funded by more than 1,100 people from around the world, LEGENDS OF THE KNIGHT is a return to our childhood dreams of becoming a hero. Culp's LEGENDS OF THE KNIGHT has screened in over 100 cities to date, with proceeds benefiting charities and the families they serve. Each screening has become an evening of inspiration and heroic possibilities for families - complete with superhero costumes and capes - while raising awareness and funds for charity. More than 60 charities have benefited, including Ronald McDonald House, Make-A-Wish Foundation, St Jude's Children's Research Hospital, Boys & Girls Club of America, the Muscular Dystrophy Association, the Special Olympics, children's hospitals and more. "Not your typical superhero flick," said USA Today. "I didn't expect to get teary-eyed." Said Nerdvana, "This is one of the most uplifting films you're likely to see this year. Highly recommended." Movie Pilot called it "the most important superhero movie you should see this year." Put your cape on and get inspired by the Dark Knight! About Virgil Films - Virgil Films & Entertainment was founded in 2003 by Joe Amodei to acquire, market, and distribute DVD, TV and Digital product in the theatrical feature film, documentaries, special interest and sports categories. The company has built partnerships with OWN, Sundance Channel Home Entertainment, National Geographic Cinema Ventures, ESPN, MLB Productions, Morgan Spurlock's Warrior Poets and other high-profile entertainment brands since their inception. Releases from Virgil Films & Entertainment include the documentary Miss Representation; Todd Solondz's Dark Horse, the critically acclaimed documentary Bridegroom, the timeless Forks Over Knives, and the Oscar® nominated documentary Restrepo. They have also released the compelling Gun Hill Road, The House I Live In, A Brony Tale and others. Follow them on twitter: @virgilfilms | www.VirgilFilmsEnt.com.